No knock on the big super stores, they have there place. But it is extremely important we we remember and support our local independent retailers and service providers. Many of our most valuable resources are independent businesses and self employed craftsman. These individuals typically provide a product, level or service, and quality you can not find mass produced and hermetically sealed in cellophane. They take on risks, often working extremely hard with little support to do something they love and believe in. It's a way of life, which may mean trading one perk for another (e.g. a retirement plan or health insurance for the flexibility to be available to their children). When possible I encourage you to make the choice to spend your dollar in support of small or local business. You can often find better products and service for yourself while helping others live their dreams. McCall Creek Farms a must stop summer or fall when driving HWY 281 between Blanco and Johnson City for farm fresh produce. The blackberries never survive the drive home. These just of few of my favorites. It's just around the corner... Although I will be in Los Vegas attending the Glass Craft Expo on opening day, I intend for my work to be present even if I am not. This event has encouraged me to continue to pursue ways to include letter forms in glass. I have also been exploring different ways to mount and display glass to accommodate this more traditional framed art event. I currently have two pieces prepared and am working to flesh out any of my other works in progress between now and then. What great fun it was to participate in the first of what will hopefully become an annual event focusing on San Antonio art and culture. 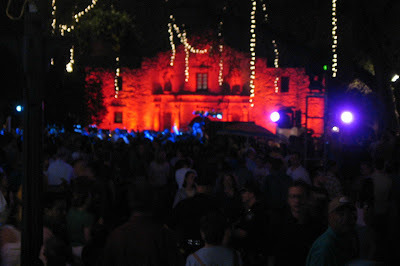 I thoroughly enjoyed the opportunity to work directly in front the Alamo a iconic Texas landmark, while listening to the San Antonio Symphony play live. It doesn't get cooler then that. 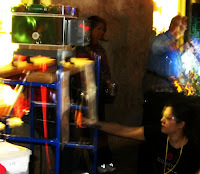 Glass alley, the stretch between the Alamo and San Antonio River, included members of the San Antonio Glass Art Guild (SAGAG), the Society of Artisan Lamp workers in San Antonio (SALSA), Wired Designs Studio, Dragonfire Hot Glass Studio and Garcia Art Glass. Here are a few pictures of me doing a demonstration on pulling Vitrograph using a kiln, equipment and glass provided by Wired Designs Studio. You can also see clips of SALSA members on their torches at MySA.com. 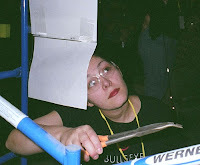 None of this would have happened without the hard work of Nina "Sam" Hibler who coordinated the participation of this band of glass artists. Thanks again Sam! While I'm thanking people, I should include My Place Bar & Grille who provided the tables and chairs used by SALSA's lamp workers to set up torches and by SAGAG members to display glass and distribute information. Thank you David. 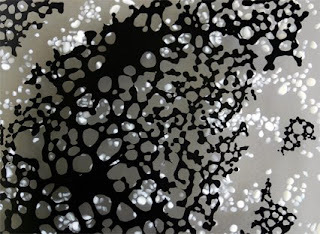 The March 13th Inspire Me Thursday Challenge reminded me of a couple of pieces I made in 2007 using pieces of a black powder wafer. Although officially untitled I had referred to the piece on the bottom right as inkblot in my personal notes. 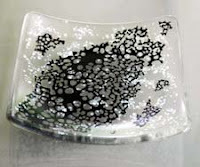 So, this week I pulled out some glass powders and set to work making a few more of these "inkblots". The question being what will I do with them now. They may end up in pieces I complete months down the road. 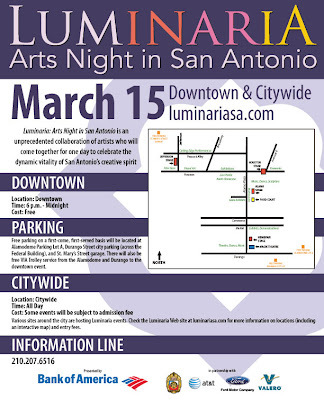 Luminaria will be an all day celebration of the Arts in San Antonio giving the community the opportunity to experience the city's diverse cultures through a day of performance and participation on Saturday, March 15th. Artists and non-profit organizations are coming together to celebrate San Antonio's creative spirit through visual, multi-media, theatre, dance, music and other art forms. This is the first year of what is hoped to become an annual event. 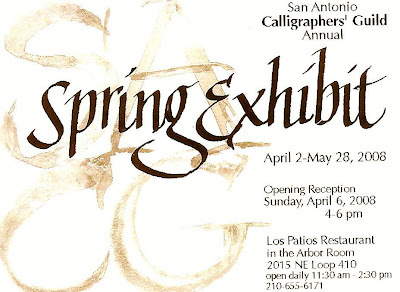 The San Antonio Glass Art Guild (SAGAG) will be participating in this event from 6:00pm to Midnight. Glass Alley's location will be downtown across from the Alamo. 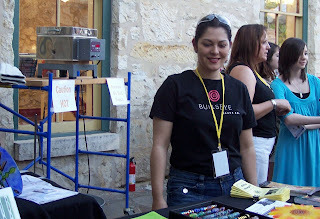 This will be an exciting opportunity to see glass making at work, visit local glass galleries and obtain information on the San Antonio glass community. 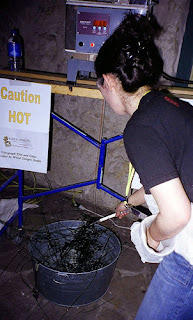 We still need SAGAG members to volunteer to hand out materials on our organization and talk to the public about glass. Please contact Sam Hibler if you would like to participate. A big BIG thanks to Sam Hibler with Dream Fire Glass, who has worked very hard on SAGAG's behalf to coordinate our participation with the city. Hope to see you there March 15th from 6pm to Midnight! 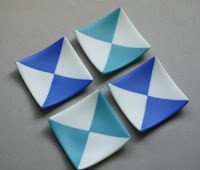 As the temperatures dip toward freezing on what may likely be one of the last of this winter's cold nights I am reminded of a blue and white series I completed and have yet to share with you. This group of work is currently housed at Artisans International in Minden, Nevada. 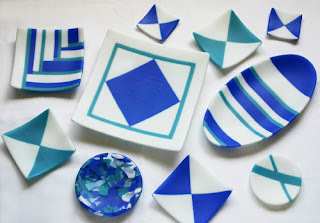 Although the patterns vary the pieces are all tied together by the color pallet of dense white, cobalt and powder blue. This series includes a 12" oval platter, 9 1/2" square sushi, a 6" stripped square sushi, a set of four square 5" sushi, two 3" square sushi, a 5" shallow bowl and a 6" cast bowl. These pieces do not have the shine one might typically expect of glass but rather a gentle sheen that reminds me of the look you get when the sun reflects off a new snow. Although it has been a long, long time since we have seen snow in San Antonio and we certainly won't be seeing any tonight. This event is hosted by the Church youth as a fund-raiser for a Summer 2008 Mission Trip to North Carolina.